I once loved my country, but now the only thing that shames me is that I'm German. I'm not a fan of poetry, but I enjoyed how this book depicted the life of a German girl who was brave enough to stand up to the diabolic Hitler. Usually, when people talk about the first or second World War, the Germans, in general, are the antagonists. After all, they murdered countless Jews in their infamous concentration camps. However, gleaning from the text, it's a sad truth that the mentioned latter dictator ruined the lives of his own people. Hence, we should be objective and not hold every German responsible for his unfathomable cruelty. White Rose was also the name of Sophie's group/organization that aimed to enlighten citizens to the darkness of Hitler's advocacy. With the help of her brother Hans and other courageous young adults, Sophie printed tons of anti-Hitler propaganda and distributed them across the nation. Despite the threat of incarceration and death, Sophie continued to fight for what she believed was right. I initially hoped for a happy ending, but this novel proved that stories about war rarely conclude that way. For me, the best thing about this book was Sophie and Han's relationship as siblings and co-rebels. When Hans had to use his medical skills to help the German army fight against Russia, Sophie never failed to send him letters and pray for his safety. Moreover, they always saw eye to eye on matters concerning Hitler. Sophie was the one who thought of publishing revolutionary leaflets, but Hans was the one who made her dream a reality. Finally, the siblings hang out all the time since they had the same circle of friends. Sophie and Hans were together until the end, and it was hard to read about their "inevitable" demise. If you're a fan of strong family bonds in YA, this literary debut will not disappoint you. Ultimately, I gave White Rose 4 stars because of its inspiring and scholarly content. If I lived during Hitler's time, I wouldn't be brave enough to be a martyr like Sophie and Hans. This is the second historical book I've read this year, and I can hardly wait to start another one. 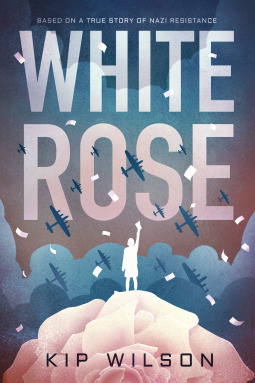 Sign into Goodreads to see if any of your friends have read White Rose. 54.35% "I'm still not sure if changing the format or spacing of a novel counts as poetry. xD"